Love Textures: One thing all mountain modern homes have is a variety of textures. They combine both the classic modern textures like glass and stainless steel, along with natural textures like faux or real animal hides and rough stone. Rustic Decor: Don't be afraid of picking a few focal rustic decor pieces like an antler chandelier or a mounted animal head. Mountain modern is perfect for outdoor enthusiasts that want to celebrate nature without wanting to feel like they live in a log cabin. Lots of Light: Lots of windows are key in a successful mountain modern home. What better way to embrace nature than to be able to see it from your living room. 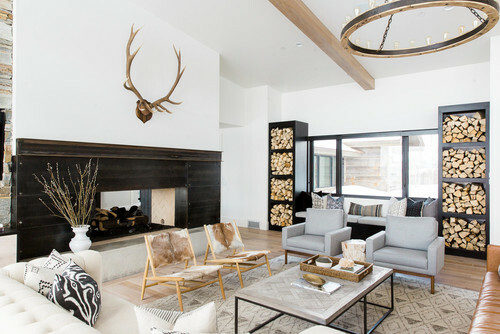 Modern light fixtures with mountain flair like these from The Peak Antler Company are the perfect partners to plenty of natural light during the day. Comfortable Ambiance: While you want all the bold design choices of a modern design, make sure to include the comfort of a mountain home, like lots of throw pillows and comfortable seating. You want the design to be both classy and inviting. Hopefully these design ideas give you a place to start with your mountain modern design. Create the mountain getaway you've always wanted with the modern flair to match your style. Contact us today at The Peak Antler Company for more great mountain modern lighting ideas.